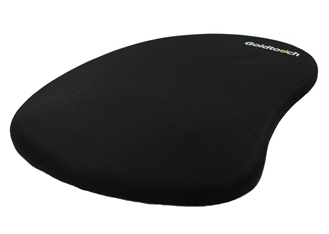 The unique design of the right handed Goldtouch Gel Filled Mouse Pad allows users to mouse in greater comfort. The right handed Gel Filled Mouse Pad features a gentle slope and curve to the mouse pad; it’s uniquely designed to better protect your hand and wrist from hard surfaces. The Gel Filled Mouse Pad was designed to be a safe respite while mousing and ensures that you’re in complete comfort while pointing, clicking and scrolling away on your computer. The computer Mouse Pad is made of dual textured stress-dispersing gel, with a black or Navy Blue Lycra cover providing excellent track-ability.